TOY's new album, Clear Shot, comes out Oct. 28. Steve Gullick, Courtesy of the artist. Altered consciousness, dreamy detachment and a healthy streak of escapism have long been hallmarks of psychedelic music. TOY is well aware of this — but at the same time, the British band is savvy enough to know just how far a pop song can be pushed, pulled and stretched. 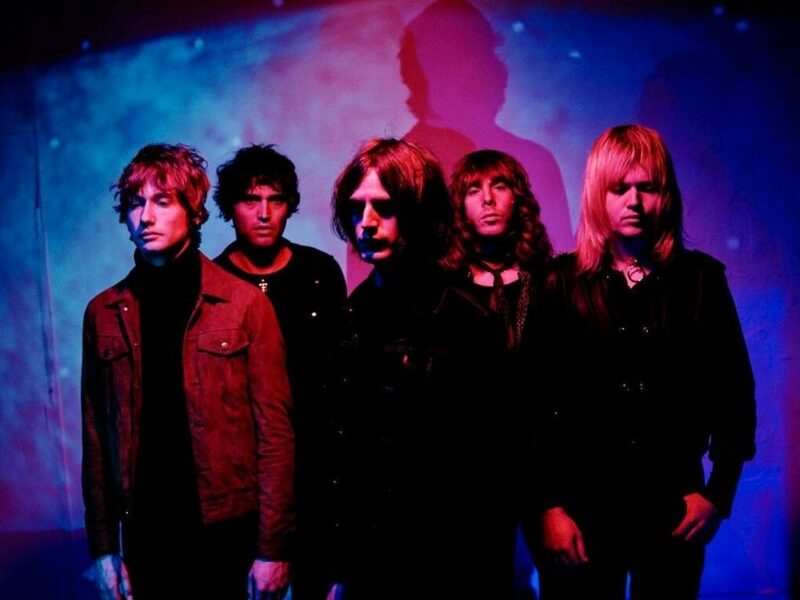 On the group’s first two albums, 2012’s TOY and 2013’s Join The Dots, infectious indie rock bleeds into trippy studio effects, hypnotic rhythms and otherworldy textural manipulation. Much of the credit goes to frontman Tom Dougall, whose spun-sugar voice and dynamic songwriting ties together the outfit’s ambitious, wide-angle soundscapes. After a three-year break from studio albums, TOY is releasing its third full-length, Clear Shot, and it’s even further proof of just how vivid and inviting psychedelia can be in the 21st century. Dougall — along with guitarist Dominic O’Dair, keyboardist-guitarist Max Oscarnold, bassist Maxim Barron and drummer Charlie Salvidge — infuses songs like “Another Dimension” and “Clouds That Cover The Sun” with the wide-eyed enchantment of a kids’ magic show. “Time runs free / Stretches and it squeezes / Everything and anyone it sees,” Dougall coos at the start of “Another Dimension,” marveling at the elasticity of space-time before the song erupts into a serotonin-triggering chorus. Despite its title, “Clouds That Cover The Sun” is just as euphoric, even as its melancholy undertow pulses along at the speed of Oscarnold’s gently burbling keys. For all its billowy, pillowy bliss, Clear Shot can also get intense. “Spirits Don’t Lie” is more of a droning meditation than a gleeful traipse, with Salvidge’s nervy percussion feeling like a palpitating heartbeat. Still, for each of the album’s pockets of shadow, there are a dozen bursts of sun. There’s a buoyant skip in “We Will Disperse” that’s reminiscent of The Flaming Lips‘ bubblegum grandeur, while “I’m Still Believing” slinks along with a silky flourish. “So simple, so fine / She perfectly read my mind,” speak-sings Dougall, too caught up in butterflies to worry about being melodic. Snatches of everyone from Can to Stereolab to MGMT can be heard in Clear Shot‘s chugging-yet-supple anthems to ecstasy. “Dream Orchestrator” is the catchiest of the lot; propelled by a throbbing beat and effervescent synths, it’s by far the danciest track on the album, not to mention the most forward-gazing. The chorus alone could be bottled and sold as an antidepressant, fueled as it is by easygoing hooks, squalls of breathless noise and upward-spiraling rapture. Rather than relying too heavily on the work of psychedelia’s past masters, Dougall and crew have put a futuristic spin on hallucinatory pop — that is, if the future were something to be viewed with romance and wonder instead of today’s all-too-pervasive doom.